This new steampunk series opens in 1880, when women aren't allowed to vote, much less dress up in a costume and fight crime. But twenty year-old socialite Sarah Stanton still dreams of becoming a hero. Her opportunity arrives in tragedy when the leader of the Society of Paragons, New York's greatest team of gentlemen adventurers, is murdered right before her eyes. To uncover the truth behind the assassination, Sarah joins forces with the amazing mechanical man known as The Automaton. Together they unmask a conspiracy at the heart of the Paragons that reveals the world of heroes and high-society is built on a crumbling foundation of greed and lies. When Sarah comes face to face with the megalomaniacal villain behind the murder, she must discover if she has the courage to sacrifice her life of privilege and save her clockwork friend. "The Falling Machine is quite simply the coolest steampunk superhero book I've ever read. . . . Imagine if Gangs of New York had been directed by Jules Verne, instead of Martin Scorsese, [and] you're probably not too far off." "If Stan Lee had lived in the 1880s, [The Falling Machine] is the book he would have written- steampunk superheroes. Filled with larger-than-life characters, cliff-hanger action, and ingenious gadgets so richly realized you'll feel the steam hissing from them, at its heart, it's a two-fisted meditation on the mythic glories of heroism and the tragic frailties of the heroes themselves." "[A] glorious conceit. . . steampunk superheroes in Gilded Age New York City. 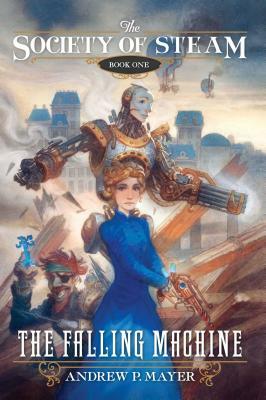 [The Falling Machine] offers cocked-eyed adventure and the high camp of steampunk wrapped around a story of moral choice, family loyalty, and the ultimate question of who gets to be counted as a person. A ripping yarn that strikes all the right notes, [it] will delight and entertain you."